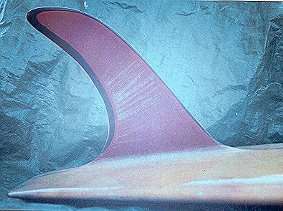 1966 Keyo Malibu- Thin rail 9 ft 5"
Foam blank with 1/2" redwood stringer, glassed in Volan with 2" rail lap, post production leg rope block. Traded for rejigged San Juan Mini Mal # 32. Repairs in Volan, chop-strand and foam blocks, except deck delamination repaired with Q-cells (a mistake). Board glossed and polished by Jackson Surfboards. Nat’s Nat Pages 124 - 145 Text and photographs. CONDITION: 7, two extensive stains, Q-cells in deck.